Grubzon - A Gourmet Voyage: Thalassa Greek Taverna - Khar, Mumbai. Thalassa Greek Taverna - Khar, Mumbai. 'Thalassa' meaning "The Sea" in Greek is well known to travel enthusiasts as one of the iconic eateries in Northern Goa. Thus ask any one of those well-travelled fellows and they will always draw a comparison between Mumbai's and Goa's Thalassa. As a person who is less into partying and more into adventure and relaxing, I have always favored the quieter Southern Goa more. As result, I have never been to Goa's Thalassa so far. Hence for me the Thalassa experience was a completely fresh one. The Goan Thalassa is more of a sea/beach themed place while Mumbai's Thalassa is a more of purist Greek Tavern. Understanding this distinction actually helps one appreciate the work put behind Mumbai's Thalassa. 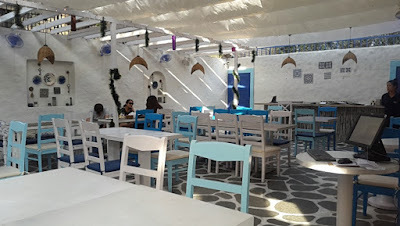 Thalassa has four different seating areas - a front road facing Al fresco which is more suited for parties and big functions, A classy indoor, a Basement lounge and a backyard Al Fresco which is probably the most Greek themed space of the four. The indoor area is a mix of modern and a bit of Baroque. Snapshots from Greece adorn a wall as well. The backyard tavern has a bit of Santorini's white theme and a bit of a party vibe. In the day time, it wears its clothes of serene white beauty but at night its totally different and quite amazing. Thankfully, the restaurant sticks to its theme and plays Greek music and not Kenny G, Bollywood or EDM as in cases of most other restaurants. 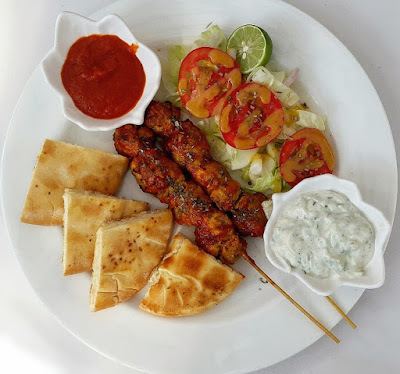 Chicken Souvlaki Skewers were juicy meat chunks wrapped in spices and served with Pita, salad, sundried tomato paste and Tzatziki. Souvlaki has been eaten in Greece for thousands of years with excavation records putting it as early as 17th century BC. These are uniquely Mediterranean in flavor and very different from Shish Kebabs, Yakitori or Satay. A few Turkic influences can be felt though since the meat tastes close to a Doner Kebab. One could eat the meat right off the skewer or place it in a pocket styled out of the Pita. Thalassa Special Salad looked a bit dull when compared to the Souvlaki. 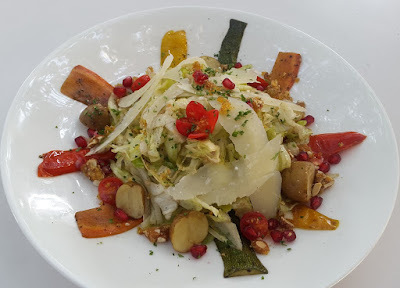 The visuals could clearly use improvement as Salads are always supposed to be visibly enticing. The sensations that stood out were the subtly savory baby potatoes, a crunchy element from the pomegranate, sweetness from the caramelized onions and the salty Feta. It was a decent salad but would perhaps work better for a vegetarian. 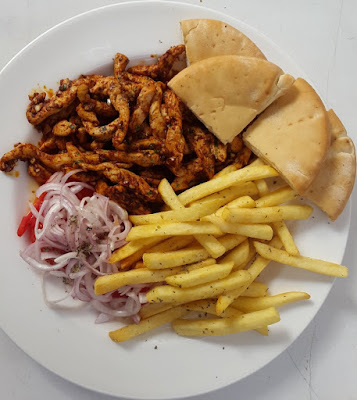 Chicken Gyros is perhaps the only Greek dish that an average Indian epicure would know of. This however makes it more important as one finally has a dish which one has sampled before. The presentation initially confused me as Gyros is traditionally a Pita based sandwich or a variation of Pitawich. Thalassa however lets you create the sandwich yourself. This allows one to style the sandwich themselves . Though it does run the risk of an inexperienced customer ruining the set up and then blaming the restaurant. We do live in an era where a scapegoat solves all problems. I ended my meal with this Amore Chocolate Gelato. 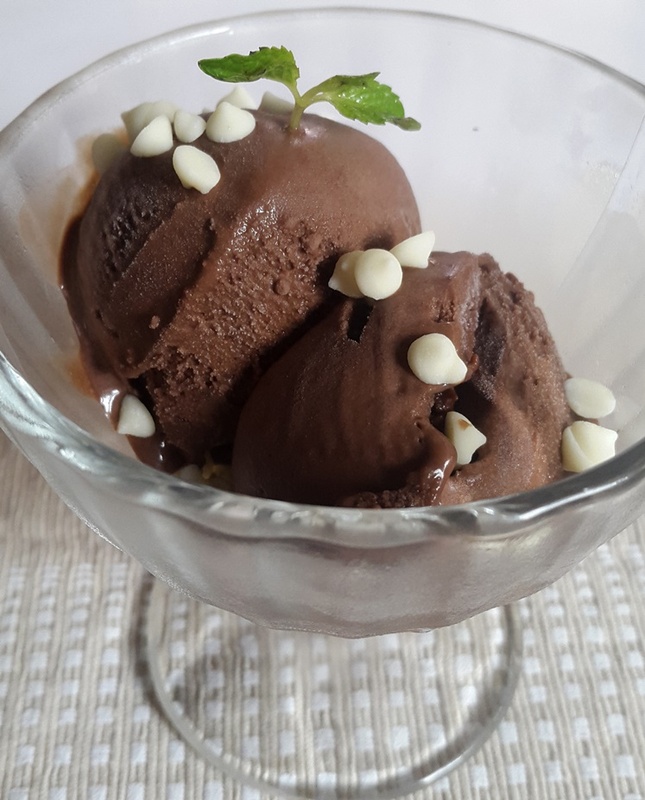 Though Thalassa did have Baklava, it did not visibly stand out to me and I chose to play it safe with a frozen dessert. The service is one of the high points of the restaurant as the crew is well trained, well kept, knowledgeable and professional. They can efficiently cater both local and expatriate patrons. The pricing however feels on the higher side. A meal for two with drinks could easily top Rs 2500. I think that the prices could be a little lower than what those are now. Thalassa offers the complete Greek package - The food, feel and the ambiance. I'd greatly recommend a dinner trip so that one could savor both the food and the feel of the place.